Break bread and celebrate the good life with your loved ones around our Refectory Table dining room table. The Refectory Table, which is made in our Cape Town workshop as part of our Made by Block & Chisel range, is an essential addition to any home. Not only because of its stylish attributes, but also because it can be made to your required specification, meaning you never have to worry about space around the table for that extra unexpected guest. The table was inspired by the historic Oxford Hall tables where college students and their esteemed professors dined together. 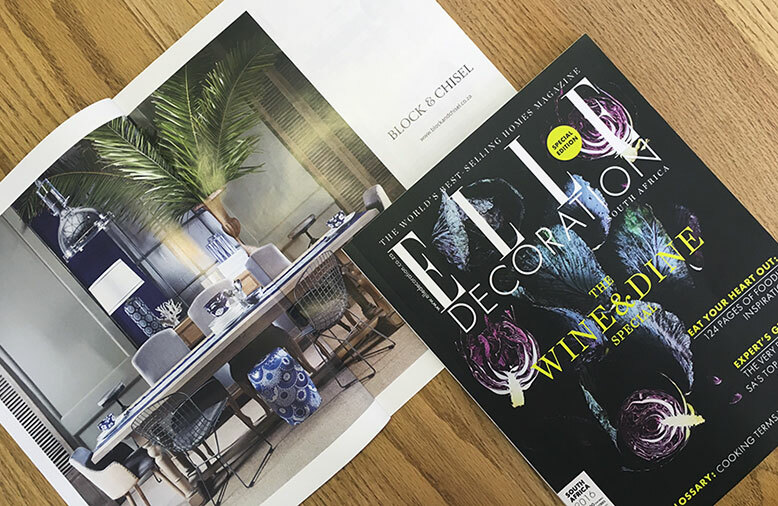 In a double-page advert we placed in the special edition of Elle Decoration, we've brought this classic English design up to date with the addition of Warburton chairs, Zengu ceramic stools and a touch of blue for a cool ambience in summer. Summer time is synonymous with days spent socialising, almost always around the dining room table, and often with more people than you expect. Speaking of sharing a meal, Bielle continues in her editors note: "Not only is it a universal experience that connects us, but I would go so far as saying that it can be a transcendental adventure that manages to, if even for a moment, suspend all our worries and responsbilities and just allow us to revel in the moment." We were thrilled to be a part of Elle's gorgeous Wine & Dine special edition which takes a look at all things food and wine, from table décor to great recipes and everything in between. A few of our products were also featured on Elle Decor SA's Shop the Look pages, which offer ideas around how to achieve a vintage look for your table decor. From the Jenny Crossback Chair, to the Crested Wine Cooler, you'll find all the items you need to create the perfect dining room setting at Block & Chisel. Heavy pendant lights that have that industrial spotlight look are all the rage, and where better to hang this kind of light fitting than in the kitchen area? So advises Elle Decor in its feature on kitchen style, adding that the Montgomery Bronze Pendant from Block & Chisel makes for a nice option. Pop into Block & Chisel while you’re shopping for your holiday celebrations. Our product variety means that you’ll find the perfect items for your summer table, from a formal affair to a relaxed braai with family. We are always adding new ranges of interesting items to our stores, so be sure to find your favourites while stocks last.